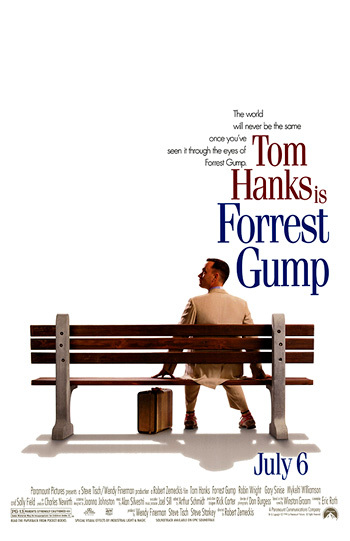 The Best Picture film, director Robert Zemeckis' Forrest Gump, was a feel-good, financial blockbuster (and the most commercially-successful Best Picture winner up to this point in Academy history, at $330 million) with Zelig-like style (a la Woody Allen) computerized special effects that put the title character (a dim-witted, guileless, Southern-drawling simpleton hero) into historical events and footage in the four decades period from the 1950s to the 1980s. The film, from a screenplay by Eric Roth and based on the novel by Winston Groom, inspired merchandising and "life is like a box of chocolate" Gumpisms. The film was variously interpreted as a satire on contemporary values, a parable on the "ignorance is bliss" philosophy, and a look at America's mid-century accomplishments. The title character was portrayed as the catalyst for such disparate moments as the jogging craze, the expression "Have a nice day," and ping pong with the Chinese. Its tagline was: "The world will never be the same once you've seen it through the eyes of Forrest Gump." It had thirteen nominations and six wins - for Best Picture, Best Director, Best Actor, Best Screenplay, Best Film Editing, and Best Visual Effects. Only four previous films had matched its 13 nominations: Gone With The Wind (1939), From Here to Eternity (1953), Mary Poppins (1964), and Who's Afraid of Virginia Woolf? (1966). Only one film had previously had more - fourteen nominations - All About Eve (1950). producer/director Robert Redford's intelligent Quiz Show (with four nominations and no wins), an engrossing recreation of the late-1950s TV quiz show scandals involving a show called "Twenty-One"
Robert Zemeckis (with his first directorial nomination) won the Best Director award for Forrest Gump. Two of the five directors of Best Picture nominees were not considered for Best Director. Mike Newell and Frank Darabont were not nominated in the Best Director category, and they were replaced by writer/director Woody Allen (with his sixth directorial nomination) for Bullets Over Broadway (with seven nominations and one win - Best Supporting Actress) about a Roaring Twenties Broadway playwright-turned-director who is backed by a mobster, and Polish writer/director Krzysztof Kieslowski for his French-language film Red (with three nominations and no wins), his last film until his death in 1996, about a friendship between a young Geneva model and a reclusive retired judge - the third and final film in his Three Colors trilogy. The only first-time Oscar winner was Best Supporting Actor nominee Martin Landau. The Best Actress category had no real front-runner and was composed of weak performances, for the most part. The winner - 45 year old Jessica Lange (with her sixth nomination and second Oscar), who won the Best Actress award as Carly Marshall, the unstable, manic-depressive, out-of-control, sexually-promiscuous wife of a military nuclear engineer/officer (co-star Tommy Lee Jones) at a 1960s Nevada test site in director Tony Richardson's last film - Blue Sky (the film's sole nomination). Sixty-six year old Martin Landau (with his third nomination after prior nods for Tucker (1988) and Crimes and Misdemeanors (1989)) won his first Oscar in the Best Supporting Actor category for his tragi-comic performance as aging, drug-addicted horror-actor Bela Lugosi in producer/director Tim Burton's Ed Wood (with two nominations and two wins - including Best Makeup), about a lunatic-fringe, Hollywood campy film-maker. It should be noted that The Lion King (with four nominations and two wins - the other win was for Best Original Score) had three nominated songs (by Elton John and Tim Rice) this one year: "Can You Feel the Love Tonight" (the winner), "Circle of Life," and "Hakuna Matata" - tying an Academy record. Previously, Beauty and the Beast (1991) had solo possession of the record. 82 year-old Italian writer/director Michelangelo Antonioni, maker of Neorealitic films early in his career, was given the Honorary Award this year "in recognition of his place as one of the cinema's master visual stylists". Noted for the character study L'Avventura (1960), he became well-known for his first English language film, the psychological thriller Blow-Up (1966). It was one of the most important films of the 1960's, an existential, voyeuristic murder mystery/suspenser, from which he derived his two sole (unsuccessful) Oscar nominations (Best Director, Best Original Screenplay). It was followed by the disastrous hippie saga Zabriskie Point (1970) and then the underrated political film The Passenger (1975) with Jack Nicholson. 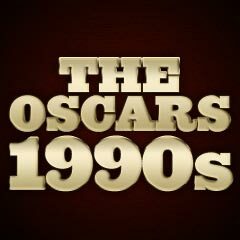 There were a number of major oversights in 1994. First, it was an unforgiveable error to deny nominations to John Turturro for his performance as the almost unbeatable "Twenty One" show champ and then loser - hotheaded, middle-class Jew Herbie Stempel, and to Ralph Fiennes as intellectual contestant Charles Van Doren, in Quiz Show. Also, both Brad Pitt (as Tristan Ludlow) and Julia Ormond (as Susannah Finncannon) were neglected for their performances (supporting and lead) in the cinematographic romantic western/drama Legends of the Fall (with one win from its three nominations, for Best Cinematography). Although nominated in three categories, Little Women should have also been nominated for Best Director (Gillian Armstrong - another missed opportunity to nominate a female director!) and Best Adapted Screenplay (Robin Swicord). Linda Fiorentino's sexually-exciting performance as femme fatale Bridget Gregory in John Dahl's modern-day noir The Last Seduction was denied Oscar consideration for Best Actress because the film was briefly debuted on HBO cable television. Russell Crowe was neglected for his early role as a gay man (opposite his widowed father Jack Thompson) in the Australian film The Sum of Us. And Kate Winslet was snubbed for her star-launching, breakthrough role as lonely, vividly imaginative Juliet Hulme in director Peter Jackson's R-rated thriller Heavenly Creatures (with only one nomination for Best Original Screenplay), based on the true 1954 New Zealand murder story in which two teenaged girls (Pauline Parker, portrayed in the film by Melanie Lynskey, and Juliet Hulme) murdered one of their mothers in order to prevent the separation of their lesbian-tinged relationship. Alfre Woodard as tough, cancer-stricken 70s Brooklyn school-teacher and family matriarch Carolyn Carmichael in director Spike Lee's semi-autobiographical Crooklyn (with no nominations) was also ignored. And independent film-maker Steve James' acclaimed Hoop Dreams, a film about Chicago inner-city life and basketball in the lives of two inner-city youth, was denied both a Best Picture and Best Documentary Feature nomination. Oliver Stone's violent and controversial Natural Born Killers, with a Quentin Tarantino screenplay and stunning performances by Woody Harrelson and Juliette Lewis as serial killers Mickey and Mallory Knox, was completely un-nominated. Joel Coen's The Hudsucker Proxy, similar to Frank Capra's Mr. Deeds Goes to Town (1936), was completely unnominated, especially for Roger Deakins' Cinematography, as well as Jennifer Jason Leigh's star reporter Amy Archer (based in part upon Rosalind Russell's fast-talking Hildy Johnson in Howard Hawks' His Girl Friday (1940)). Despite seven nominations, including Best Director and Best Original Screenplay (and three acting nominations), Bullets Over Broadway failed to earn a Best Picture nomination -- and Carlo DiPalmi's lush cinematography was also denied recognition. And despite two nominations and two wins for producer/director Tim Burton's Ed Wood as noted above, Johnny Depp was snubbed for his role as the legendary, cross-dressing title character, noting for helming (as the "worst director of all time") a series of awful films in the 50s, such as Glen or Glenda (1953), Bride of the Monster (1955) and Plan 9 From Outer Space (1959). It was also remarkable that Darabont's The Shawshank Redemption went unrewarded - and no nomination for Tim Robbins as the lead character Andy Dufresne, nor for Bob Gunton as the corrupted prison warden Samuel Norton. Jodie Foster's loss for her raw performance in Nell to Jessica Lange's performance in Blue Sky was also surprising. And both Ben Kingsley and Sigourney Weaver were not recognized for their stellar work in Roman Polanski's drama Death and the Maiden, about a Dr. Roberto Miranda (Kingsley) who may/may not have traumatically tortured-raped Paulina Escobar (Weaver) when she was imprisoned by the previous South American country's government.